"I'm very happy to be in the great state of Texas and I'm especially pleased to be with you, who are part of the great Spanish tradition, which has contributed so much to Texas. This tradition began 100 years before my husband's state, Massachusetts, was settled, but it is a tradition that is today alive and vigorous. You are working for Texas and the United States. Thank you and viva las LULACS." Many, many First Ladies took an active interest in matters of foreign affairs and some often weighed in on their husbands decisions or those of the Secretary of State. Frankly, I don't know where to begin because there are several abstraction levels of information to all this. You might be able to pick through the individual biographies that we have posted on the website and search through the sections on their White House years for pull some information out - however, not all of the biographies have been updated from the original ones and thus will be missing information. That said, I know for certain that the following have been posted and will have general summary information you are looking for: Abigail Adams, Dolley Madison, Elizabeth Monroe, Louisa Adams, Bess Truman, Ida McKinley, Nellie Taft, Edith Wilson, Bess Truman, Jacqueline Kennedy, Pat Nixon, Rosalynn Carter, Nancy Reagan, Hillary Clinton, and Laura Bush. You might also look at Lucy Hayes's biography for her views on immigration to the US from foreign countries. Unfortunately, some of those who also took direct roles in foreign affairs have not yet had their new biographies writtern or posted: Edith Roosevelt who served as a private emissary between the President and British Ambassador, Florence Harding who disagreed with Commerce Department policy on provisions to send supplies to Russia, Lou Hoover, who lived in a variety of foreign nations, including China during the Boxer Rebellion, and Eleanor Roosevelt - who took an especially active interest in European and Asian affairs before the United States became involved in World War II - and of course during the war. The best way to find these ancedotal accounts would be to consult biographies of them. I have written the biography Florence Harding and included her interest in foreign affairs. Sylvia Jukes Morris has written the most extensive biography of Theodore Roosevelt's second wife, Edith Roosevelt, and it includes the role she played as emissary. On Eleanor Roosevelt there are several good sources. I would recommend the basic and detailed Eleanor and Franklin by Joseph Lash for the pre-war and war years and Doris Goodwin's No Ordinary Time for the war years. On Lou Hoover, the most recent and scholarly biography to consult is Lou Hoover, part of the biographical series published by the University of Kansas. I am familiar with the story of Chryssanthemi Papakotsi, but only to a point. When Mrs. Kennedy made her first trip to Europe as an incumbent First Lady in the last days of May and first days of June 1961, the very last part of her itinerary was to Greece with her sister Lee Radziwill, then a resident of England. Mrs. Kennedy had gone with the President first and most famously to Paris, then to Vienna, then to London. From London, the President returned to the U.S. and the First Lady and her sister to Greece, where her trip was then billed as "unofficial," despite the enormous press she received there and the formal welcome from the Greek royal family. In anticipation of her trip, the Papkotsi family had managed to convey the desperate condition of their daughter's condition (described as being one of a "hole in her heart," obviously some valve-related illness but precisely what it is was is not clear from contemporary accounts). From local officials there through US-Greek diplomatic channels, word eventually reached Letitia Baldrige, the Social Secretary of the White House, who was helping make arrangements for Mrs. Kennedy's trip to Europe. I believe - but you will have to check contemporary international newspaper accounts on this - the girl may have been given transportation back to the United States on Mrs. Kennedy's plane. That said, I also seem to recall reading a conflicting account that when she arrived in Greece, she met the girl briefly (where she was also welcomed by a pelican!) , but that her wealthy father-in-law, former US Ambassador to Great Britian Joseph P. Kennedy had covered not only the transportation of the girl and her parents to New York Hospital, but also underwrote and sought the donated services of an expert medical team. Before the recovered little Chryssanthemi returned to Greece, she and her parents were invited to come visit Jacqueline Kennedy in the White House, where they were photographed in the Diplomatic Reception Room. I think if you write to the John F. Kennedy Presidential Library & Museum in Boston, researchers there may have a folder or other sources of official records which trace this incident from beginning to end. As to Jacqueline Kennedy's friendship with Father Leonard, on that I am afraid I draw a blank. I will say that throughout her life, she drew great strength, advice and guidance from the various Catholic priests and regional bishops that served in parishes where the Kennedy family worshipped or were family friends. I know that this was true immediately folllowing the assassination in her friendship with a Georgetown University priest and also in New York. In the latter part of her life, after her second widowhood, she often slipped into St. Thomas More or St. Ignatius and sat alone at the back or balcony to avoid dbeing seen by fellow worshippers and after mass, would confer with the priest. I would add that her known conversations and letters exchanged with them were more musings about the human condition rather than any specific religious or dogma questions. I hope some of this has been helpful, though I fear not entirely definitive. While it may seem like Laura Bush is taking a larger role in foreign policy-related issues, there is evidence of her doing so stemming back to the days following September 11, 2001, when she substituted for the President in the weekly Saturday radio address to address the issue of women's rights in Afganistan. Not long after that, she had her first meeting with professional women of Afganistan - several of whom had also met with the previous First Lady Hillary Clinton. In fact, on the particular issue of women's deprived rights under the Taliban rule in Afganistan, Laura Bush was continuing an issue first raised by Hillary Clinton. And while the word "traditional" might conjur up notions of Martha Washington or Dolley Madison or other early First Ladies, there is a strong body of documentation to prove that First Ladies for almost a full century have been taking an active interest in foreign affairs and, increasingly, going public with their concern. Edith Roosevelt, wife of Theodore Roosevelt, served as a secret liaison between the President and the British Ambassador, the latter writing "personal" letters to her that addressed international diplomacy issues - which she then relayed to her husband. During World War I, Edith Wilson was taught the secret code from the war front and often translated information for the President and Secretary of War. Florence Harding fired off a series of memoes declaring her strong opposition to Commerce Secretary Herbert Hoover's proposal of donating wheat and other foodstuffs to Russians during a harsh winter - unless the government there foreswore communism. Eleanor Roosevelt, in the months leading up to the U.S. involvement in World War II, spoke out frequently against the Nazi occupation of European countries and led some efforts to welcome child refugees. She did so through her radio show and newspaper column, thus marking her as the first First Lady to go public with her foreign policy concerns. She also engendered controversy when she voiced her personal support of anti-Franco fighters during the Spanish Civil War. 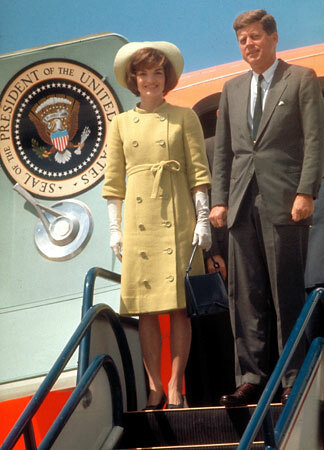 The solo foreign trips of Jacqueline Kennedy to India and Pakistan and of Pat Nixon to Liberia, Ghana, the Ivory Coast, Peru, Venezuala, and Brazil were all publicly billed as "goodwill" tours, but both women reported their observations of the political and social conditions in those countries to their husbands and - in the case of Mrs. Nixon - to Secretary of State Henry Kissinger. It is Rosalynn Carter who then assumes a highly public role in foreign affairs, making an unprecedented trip in 1977 to about a dozen Central and South American nations, meeting with political and military leaders, conveying and clarifying both standing and new U.S. policy towards those nations, holding talks on issues ranging from the price of beef exports to armament to human rights, reporting daily to the State Department and then compiling a definitive report on the state of U.S. relations to each of the nations she visited. So, as this I think will prove, the 'soft' tradition goes back to the 1900's and - save for the period of Eleanor Roosevelt between 1936 and 1945 - the definitive tradition is begun by Mrs. Carter in 1977. While the case can be made that Mrs. Bush has a stronger hand with high popularity polls to press her case on several foreign affairs issues, there are some mitigating factors. Certainly, while some of her trips to Saudi Arabia and Jerusalem have raised some small moments of controversy, her history of interest in foreign countries has largely proven positive - either in terms of simply raising attention to issues - like breast cancer in Saudi Arabia - or resulted in real benefits - like reduction of malaria in some African nations once she led an effort to get US contributions of sorely-needed mosquito netting. Thus, popularity ratings or not, she has had a successful track record of accomplishing the specific goals she had laid out. Secondly, of course, since the President is not running for re-election she is freer - as would be any First Lady in the same situation - to speak out or take action, regardless of how it was perceived in the U.S.
At present, much of what we know regarding the rather substantial extent to which Jacqueline Kennedy was not only kept appraised of international issues and crises of her husband's presidency but often weighed in with her own opinions or was participatory in discussions over the matters derives from interviews and oral histories of the principal figures, most of which seem to have been conducted for full-length biographies of her. For example, the recollections of her deliberations on U.S.-Soviet relations stem from David Ormsby-Gore, known as "Lord Harlech," the British Ambassador and close friend to both John and Jacqueline Kennedy. He gave an extensive interview on the matter with biographer David Heymann for his biography of the former First Lady in the late 1980's. While the Heymann book makes what historians tend to consider some dubious claims regarding her personal life, it is also quite likely that the Harlech interview material would have been vigorously denied or eroded over time, especially since Mrs. Onassis was alive at the time it was published. My own oral history biography of her, As We Remember Her, relied heavily in this area on interviews with former Defense Undersecretary Roswell Giltpatrick, whom I interviewed at his law office in 1995, presidential advisors Arthur Schlesinger and Ted Sorenson, also interviewed in that time period, then-astronaut and future U.S. Senator John Glenn, Senator Edward Kennedy, and John Kenneth Galbraith, economic advisor and U.S. Ambassador to India under JFK. Along these lines, further material may be found if there are oral history transcripts at the John F. Kennedy Presidential Library that have been opened to the public since my own research there in 1995 and 1996. I seem to recall that they have some fairly good finding aids which may now even be online and I was able to locate references to Jacqueline Kennedy in those oral histories that had been made by government officials, foreign heads of state or other diplomatic figures and which were then opened. Also look at my two-volume history First Ladies, most especially the first few chapters of volume two, which cover the Kennedy years. Since its publication I have disclosed that Mrs. Onassis directly though discreetly helped me with that material (in fact, she acted practically as an editor, though not removing anything but rather adding). There are also references to her interest in foreign relations prior to her marriage in volume one. While I did another book, The Kennedy White House, I did not focus quite so intently on this aspect of her White House years. Another good book which will illustrate Jacqueline Kennedy's personal relationship with British Prime Minister Harold Macmillan is The Other Side of Mrs. Kennedy, which came out several years ago. The documentation in this book presents a good example of one bit of trouble you may encounter. Quite often, as First Lady Jacqueline Kennedy would hand write letters directly to heads of state and circumvent the State Department or other officials for any clearance: this was especially true of those with whom she'd developed a personal rapport, such as India's Nehru and France's DeGaulle. Perhaps the most dramatic example of this is the famous letter she wrote to Soviet Premier Nikita Krushchev on her last night in the White House, addressing the issue of nuclear proliferation and her fear that it would not be the more responsible larger nations like the U.S. or U.S.S.R. which would resort to the use of mass destruction weaponry but rather smaller rouge nations. There was no copy of this handwritten letter made and it was not released, I believe, until several years later. I know that, for example, Krushchev himself finally released the full text of the letter in his memoirs (or they might have been in a biography edited by his son). As you may know, Edith Carow Roosevelt, wife of Theodore Roosevelt, accompanied her husband to the recently- independent nation of Panama on 9 November 1907, making her the first incumbent First Lady to leave the United States. More famously, Edith Bolling Galt Wilson, sailed from Hoboken, New Jersey to Brest, France on 4 December, 1918, with her husband Woodrow Wilson, for his participation in the Paris peace conference held after World War I. She joined him in also visiting England and Italy; they returned to the U.S. on 15 February, 1919. She thus holds the record of an incumbent First Lady being out of the U.S., a total of 72 days. Grace Coolidge traveled with her husband, incumbent President Calvin Coolidge to Havana, Cuba in January of 1928, where he delivered the opening address of a Pan-American Conference. Eleanor Roosevelt was the first incumbent First Lady to travel solo. Her trips were made as a representative of the American Red Cross during World War II: to Ireland and England in 1942, to active U.S. military installations in Australia, New Zealand, Guadalcanal and other South Pacific islands in 1943, and to non-combat military bases in Central, South American and Caribbean basin nations in 1944. She became the first incumbent First Lady to also make such trip by air flight, over the Atlantic and Pacific oceans. Jacqueline Kennedy's famous meetings with Charles DeGaulle in Paris, Nikita Khrushchev in Vienna and Queen Elizabeth in London, occurred when she accompanied her husband during his first trans-Atlantic trip, in May and early June of 1961, visiting France, Austria and England. At the end of the presidential tour, she went on her own to Greece, thus marking her first solo trip. She would also join her husband to Venezuela and Colombia in December 1961 and Mexico in June 1962. She continued to make solo trips. In April 1962 she was designated as a "goodwill ambassador" of the U.S. government during trips to India and Pakistan, and during her visit to the latter nation she proceeded to the Khyber Pass and the Afghanistan border. In August of 1962, she took a vacation in Italy; even though the White House listed her trip as a "private citizen" she interceded with the U.S. government to provide disaster relief during an earthquake that took place while she was in that nation. She had a similar quasi-official status when she visited Greece and Morocco in October and early November of 1963. Lady Bird Johnson made no solo trips to foreign nations as an incumbent First Lady. In combination with the foreign trips she made with her husband Richard Nixon and those on her own, Pat Nixon for many years held the record as the most traveled First Lady. Her most notable and highly-visible trip with her husband was to China in 1972. However, she initiated her own humanitarian trip to Peru, when that mountainous nation was hit by a devastating earthquake in June 1970. In January of 1972, with the official but temporary designation as "the president's ambassador" she visited three African nations - Ghana, the Ivory Coast and Liberia. She addressed the parliaments of all three nations, discussing American state policy on Rhodesia and South Africa. In March of 1974, she made a solo trip to the inaugurations of South American presidents in Venezuela and Brazil. Betty Ford was the last incumbent First Lady who made no foreign trips independent of her husband. 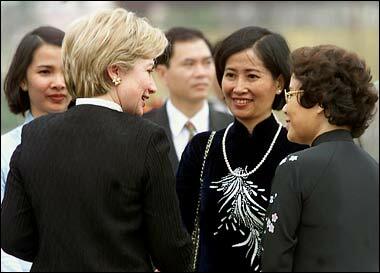 Since 1977, each incumbent First Lady has made numerous foreign trips, both with their husbands and on their own. Among the most noteworthy have been those of Rosalynn Carter as "the president's representative" in 1977 to multiple Central and South American nations where she discussed serious policy issues including exports, human rights and nuclear weaponry, and in 1980 to Thailand as part of a global emergency relief effort on behalf of Cambodian refugees. Nancy Reagan attended the wedding of Prince Charles to Diane Spencer in London, England, in July 1981. Barbara Bush led the U.S. delegation attending the inauguration of the president of Costa Rica in May of 1989. Finally, in September of 1995, Hillary Rodham Clinton attended the United Nations Fourth World Conference on Women in Beijing, China, giving a strong policy speech that rebuked the host nation's violations of women's and children's rights. It is difficult to specifically state who is the most "traveled" First Lady since such a designation could be determined by several different factors: how many different nations were visited, whether return trips to the same nation are to be counted, whether "travel" means one trip to one nation, or one trip with several stops (for example, on one of her first foreign trips with her husband, Pat Nixon went to Guam, India, the Philippines, Indonesia, Pakistan, Romania, England and South Vietnam).